Right, Reggie. Back to work. We get it. I love NFL training camp, not because football is upon us again (if it’s still hot, it’s still baseball season, in my mind) but because of the sheer entertainment value of the photos. 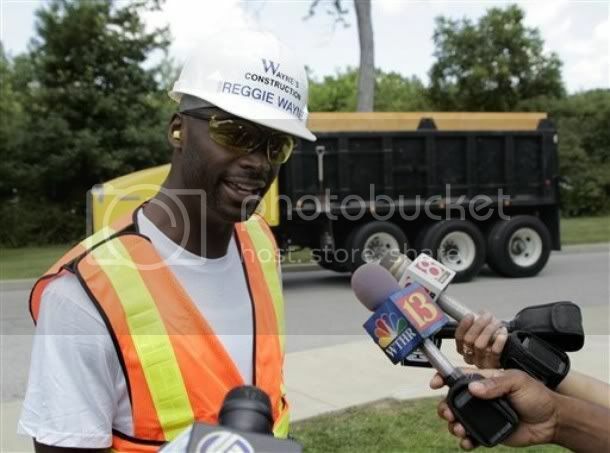 Reggie Wayne showing up to training camp in a dump truck, dressed as a construction worker? Obvious publicity grab, sure, but funny in a look-at-the-rich-and-talented-athlete-being-a-cheesy-goofball sort of way. Strangely enough, Reggie’s transportation related stunt reflected a similar theme in many of the less staged photos of training camps across the league : the many unusual ways in which the athletes travel to and around their team’s facilities.